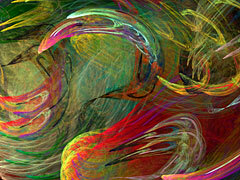 UntoldImage specializes in the creation of unique and distinctive computer generated artwork of the highest quality and resolution. These dynamic and spellbinding images are a unique type of iterated 3D fractal that is very computationally intensive to render. A complicated process using many different software packages running on 3 different operating systems are used in the creation of each image. The final result is the most spectacular, high resolution, digital art you may have ever seen. Take a look for yourself on our gallery page.